Governor Hughes and Mayor Addonizio greet and cite astronaut Gordon Cooper during a brief stop over at Newark Airport on his way to Texas. Leroy Gordon Cooper, Jr. , better known as Gordon Cooper, was an American aerospace engineer, test pilot, United States Air Force pilot, and one of the seven original astronauts in Project Mercury, the first manned space program of the United States. Cooper piloted the longest and final Mercury spaceflight. Cooper was launched into space on May 15th, 1963, aboard the Mercury-Atlas 9 spacecraft (Faith 7), the last Mercury mission. He orbited the Earth 22 times and logged more time in space than all five previous Mercury astronauts combined – 34 hours, 19 minutes and 49 seconds – traveling 546,167 miles at 17,547 miles per hour. He was the first American astronaut to sleep not only in orbit but on the launch pad during a countdown. Gordon Cooper’s distinguished career continued with yet more firsts. 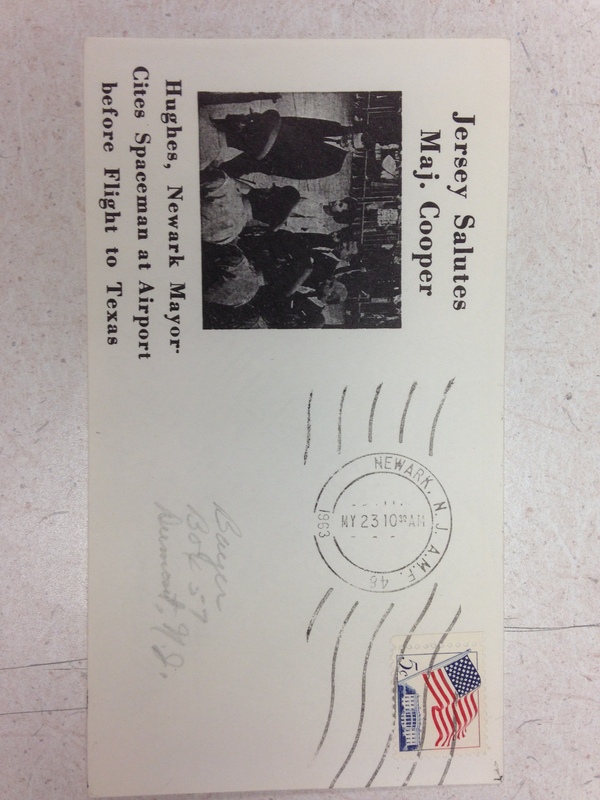 However, for the purposes of this blog and the commemorative envelope cover, displayed here in, we will proceed no further than May 1963.